Skeletal development refers to the development of the human skeletal system from the early days of pregnancy until the bones have reached full development in late puberty . The early development of the skeletal system begins in the third week after conception with the formation of the notochord (a rod-like structure along the back of the embryo that later becomes the spine, spinal cord, and brain), followed in the fourth week by the first signs of arms and legs. Between the fifth and eighth weeks, the limbs (first the arms, hands, and fingers, followed by the legs, feet, and toes) begin to extend and take on a definite shape. By the end of the fifth week, the embryo has doubled in size and has grown a tail-like structure that becomes the coccyx (lowermost tip of the backbone). By the seventh week the embryo is about 2 cm (1 in) long and facial features are visible. At this stage, the 206 bones of the human body are all set down, in surprisingly adult form. However, the process of osteogenesis (development of bone) has not progressed to the point where the bones are "bony." Ossification (the process whereby tissue becomes bone) of most bony nuclei of the long bones and round bones does not complete until after birth. Long, short, and irregular bones develop by endochondral ossification, where cartilage is replaced by bone. Flat bones develop by intramembranous ossification, where bone develops within sheets of connective tissue. Compact cortical bone, representing about 80 percent of the mature skeleton, supports the body, and features extra thickness at the midpoint in long bones to prevent the bones from bending. Cancellous bone, whose porous structure with small cavities resembles sponge, predominates in the pelvis and the 33 vertebrae from the neck to the tailbone. Bone growth is more complicated than simple elongation or simple enlargement. Most long bones add width on the outside by a process referred to as subperiosteal apposition (layers added to those already existing), while losing bone on the inside by endosteal resorption (breaking down and reabsorbing material at the center of a mass). At the same time, long bones gain in length by adding to the epiphyseal plate (the surface at the end of the bone). As they elongate, bones of this type go through a process called remodeling during which they change in outer shape as well. Conversely, the individual bones of the skull grow by circumferential apposition (adding layers at the circumference), while gaining in thickness by adding layers (apposition) at the surface with simultaneous resorption at the inner surface. By this process, the skull expands and becomes thicker while allowing for more brain space within. Linear growth of the long bones occurs by a different process. At birth, long bones have more than one ossification center (regions from which bone growth starts). These grow during childhood until the ends of the bone (epiphyseal plates) become fused with the shaft of the bone (the diaphysis). This process is stimulated by the hormones produced by the testes and ovaries, which provide the developmental signal that the linear growth of the long bones should reach completion or full development. Both round and flat bones of the skeleton are capable of continued growth throughout life. The many ossification centers of the body—hand, foot, knee, elbow, and pelvis, for example—are not visible by radiography (x rays) until they begin to mineralize or ossify, even though they are actually present long before such mineralization begins. The age at appearance of individual ossification centers then becomes a useful measure of skeletal development and especially in the form of "bone age" assessments of the hand, foot, or knee. Such assessments, made by taking a series of radiographs and comparing them against appropriate standards, are both highly reliable and useful estimates of the stage of physical development. Bone age assessments are, therefore, used in pediatric evaluation, especially when malnutrition , malabsorption, food intolerance, or endocrinopathies (such as hypopituitarism or hypothyroidism ) are suspected. Bone age assessments also have forensic application, such as estimating the chronological age of a cadaver. In addition, they can provide data for making age assessments for children whose birth date in unknown or for whom a birth certificate does not exist or is suspected of being inaccurate. Families adopting infants or children from countries in which there has been socioeconomic stress may find bone age assessment helpful in establishing the chronological age their adopted child has attained. The normal variability of skeletal age is about 10 percent of attained chronological age. Thus, some chronological 12-year-olds may be assessed as 14 years of age in terms of skeletal development, while others may be assessed as ten. Bone age is useful in projecting final stature; research has shown that it is more meaningful in making such projections than chronological age alone. Girls mature earlier than boys, grow for a shorter time, and ultimately have shorter overall bone lengths by about 7 percent. Adolescent girls are, in general, shorterlegged than adolescent boys; this proportional difference is also reflected in the hand and foot skeletons as well. Thus, even at comparable stature, females are shorterlegged and shorter-handed than boys; in addition, girls' bones are more gracile (narrower) than boys and are, therefore, more affected by adult bone loss. There are major genetically determined differences in relative growth rates of individual bones, in both length and width. Bone widths in general parallel differences in muscle mass and overall frame size. The sequence of ossification of the bones also differs significantly from child to child, and the different sequences are controlled by genetics. Differences in growth patterns even among siblings confirm this genetic component. There are also major population differences in skeletal proportions and bone sizes and ratios. Children and adults of African ancestry have relatively longer bones in their hands and feet; the same bones in children and adults of Japanese, Korean, and Chinese ancestry are relatively shorter. In some cases, abnormalities in skeletal development are caused by nutritional deficiencies that may or may not be reversible. Other disorders are congenital and caused by genetic abnormalities. Steroids used for chronic inflammatory illnesses can lead to thinning of bone in adults (osteoporosis) and to slower bone growth in long bones and therefore shorter status in children. During childhood, bones are growing rapidly. Bone growth is fueled by a positive energy balance, created by a well-balanced diet and healthy living environment. Even in circumstances of severe malnutrition, there may be some formation of new bone; it will, however, occur while bone formed earlier is deteriorating. During protein malnutrition, bone growth is largely halted, and existing bone is cannibalized by the body as a source of protein. Bone growth may also be limited by vitamin D deficiency , resulting in a condition called rickets (osteomalacia), which leads to soft and/or deformed bones and is caused by an inability to absorb calcium due to lack of vitamin D. Treatment and prevention involves sun exposure and vitamin D supplementation. With growing concern about adult osteoporosis, it is important to realize that the mass of skeleton built during childhood and into early adulthood constitutes bone banked against inevitable later withdrawals. For this reason there is much interest in the proposition that a calcium intake over 1,500 mg per day may build a greater skeletal mass. This proposition, however, in the early 2000s favored in the United States, is met with great skepticism in the United Kingdom. Moreover, calcium intakes during childhood are far greater in the United States than in most countries, but there is no particular evidence that the adult North American skeleton has a greater bone density (bone mass divided by bone volume). 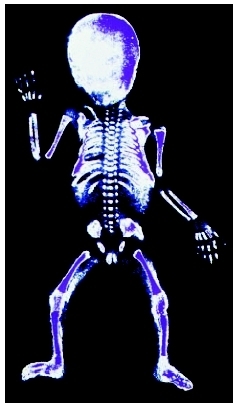 X ray showing the skeleton of a newborn. Gaps between bones indicate cartilage, which will develop into bone tissue as the child ages. Illustration depicting the stages of long bone growth, showing the process of cartilage calcifying and becoming mature, compact bone. growth in bone lengths and widths, earlier appearance of ossification centers, and earlier completion of epiphyseal union. In other words, obese children grow more, though for a shorter time period, because of their elevated caloric and nutrient intake. Bone growth is not only affected by simple caloric malnutrition due to inadequate food intake, but also if there is protein deficiency (protein-calorie malnutrition or Kwasiorkor). In protein-calorie malnutrition, lower rates of bone formation may be exceeded by higher rates of bone loss. Thus children and adolescents with protein-calorie malnutrition may show a marked thinning of the outer walls of tubular bones, and an increased incidence of bone fractures as a result. Excessive bone loss in protein-calorie malnutrition is also common in juvenile and adolescent cases of anorexia nervosa . Individuals with this condition show diminished bone density (bone mass/bone width). There is some evidence that high levels of sodium in the diet of girls ages eight to 13 can significantly increase calcium lost. This effect is particularly powerful in girls whose calcium intake is less than the recommended 1,500 mg—the amount in five glasses of milk—per day. Achondroplasia: This form of dwarfism is characterized by short stature, abnormal body proportion (limbs are shorter than normal while the torso remains of average size), and facial deformities. As a genetic disease, there is no cure. Adult height is generally less than 1.2 m (4 ft). Giantism: This condition is characterized by excessive bone growth and is caused by too much growth hormone being produced before puberty (hyperpituitarism). Giantism is treated by inhibiting the production of pituitary hormones. Hypopituitarism: Caused by insufficient production of growth hormone, this condition leads to growth failure and delayed skeletal maturation. It can be treated (if diagnosed at an early enough age) with hormone replacement therapy. Hypopituitarism can also be caused by damage to the pituitary gland. Osteogenesis imperfecta: Also called brittle bone disease, this condition is characterized by fragile bones that are prone to fracturing. It is a genetic condition that cannot be cured; treatment may involve restricting activity to minimize stress on bones and joints. Osteopetrosis: The congenital form of osteopetrosis is rare and involves the formation of overly dense but fragile bones that can lead to frequent fractures, blindness, deafness, and strokes. The more severe form of congenital osteopetrosis is usually fatal within the first ten years of life unless successfully treated with a bone marrow transplant. The question of long-bone growth and completion is of particular concern to parents of children whose growth falls at the outside edges of the normal range. In some cases long-bone growth may be accelerated by growth hormone administration if given by age nine, without speeding the timing of completion of long-bone growth. By encouraging the development of the three key elements of self esteem—acceptance, competence, and purpose—parents can help a child with skeletal abnormalities develop positive body image and confidence in his or her abilities. A healthcare provider should be contacted if a child exhibits symptoms of skeletal or growth abnormalities, such as abnormally short or tall height for age, frequent bone fractures, bony growths, or bone or joint pain . Cartilage —A tough, elastic connective tissue found in the joints, outer ear, nose, larynx, and other parts of the body. Endochondral ossification —The process by which cartilage is converted into bone. Endosteal resorption —The process by which bones are thinned from the inside. Intramembranous ossification —The process by which bone tissue is formed within sheets of connective tissue. Subperiosteal apposition —The process by which bones are made thicker from the outside. Brinker, Mark R. "Bone." In DeLee and Drez's Orthopaedic Sports Medicine , 2nd ed. Edited by Jesse C. DeLee and David Drez, Jr.. Philadelphia: Saunders, 2003. Horton, William A., and Jacqueline T. Hecht. "The Skeletal Dysplasias." In Nelson Textbook of Pediatrics , 17th ed. Edited by Richard E. Behrman, Robert M. Kliegman, and Hal B. Jenson. Philadelphia: Saunders, 2004. Root, Allen W. "Bone Strength and the Adolescent." Adolescent Medicine 13, no. 1 (February 2002): 53-72. American Academy of Orthopaedic Surgeons. 6300 North River Rd., Rosemont, IL 60018–4262. Web site: http://www.aaos.org. "Bone Development and Growth." Surveillance, Epidemiology, and Ed Results Program, National Cancer Institute , 2000. Available online at http://training.seer.cancer.gov/module_anatomy/unit3_3_bone_growth.html (accessed January 17, 2005). Ho, Wayne, and Steven Dowshen. "Bones, Muscles, and Joints: The Musculoskeletal System." KidsHealth , April 2004. Available online at http://kidshealth.org/teen/your_body/body_basics/bones_muscles_joints_p3.html (accessed January 17, 2005). My niece is 4months old and ever since she was born her right shoulder and side of her head seem to stay together and her body id very stiff, she cannot put her head back not even if I try to do it, I feel something is not right, but her mom thinks she is perfect and because my 2yr old has cancer that I am just being paranoid. Any advice? Stop constantly chckieng your Breasts or you will make them sore. Check them once a month after your period, in the shower. Soap them well and run your flat hand around your Breast. Learn where all the usual lumps and bumps are. Any new ones, go to a doctor and have them checked. Ask your doctor to check them when you have your usual yearly checkup.The chances of you getting Breast cancer at your age is so slim. Stop thinking about it, it will probably never happen.Just wanting to add for the benefit of the last poster Breast cancer is absolutely possible in a 20 year old. A three year old child has just recently been diagnosed with Breast cancer. In Australia, there have been a number of very high profile women who have been diagnosed with Breast cancer in their 20s. It is a miniscule chance, but the chance exists. Women of all ages should check their Breast each month following their period. Screening mammograms are advised over the age of 50, but in Australia can be utilised over 40 free of charge. Vigilance is important for early detection. However, over chckieng and being obsessive about it is not in anyone's best interests.